I didn’t have too much material left over from the striped work shirt, and I cut the rest of the material into same-size strips. The second checkered work shirt was deconstructed — removed the sleeves and smoothed out the rough edges. Unfortunately, the deconstructed material was not quite long enough to wrap around as a skirt. 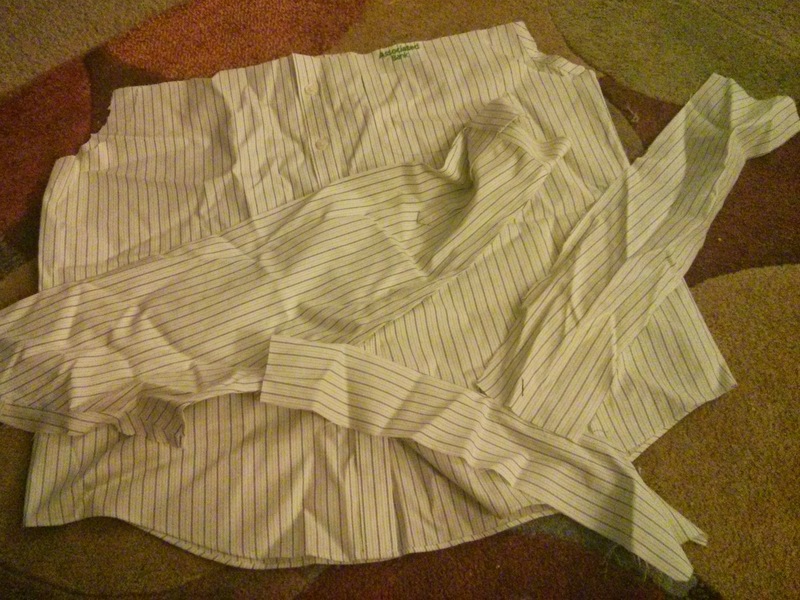 I cut up the checkered sleeves into strips and attached to the main body of the skirt. Still not long enough. Hmphf. Oh wait! I still have a few strips from the striped shirt. Awesome! 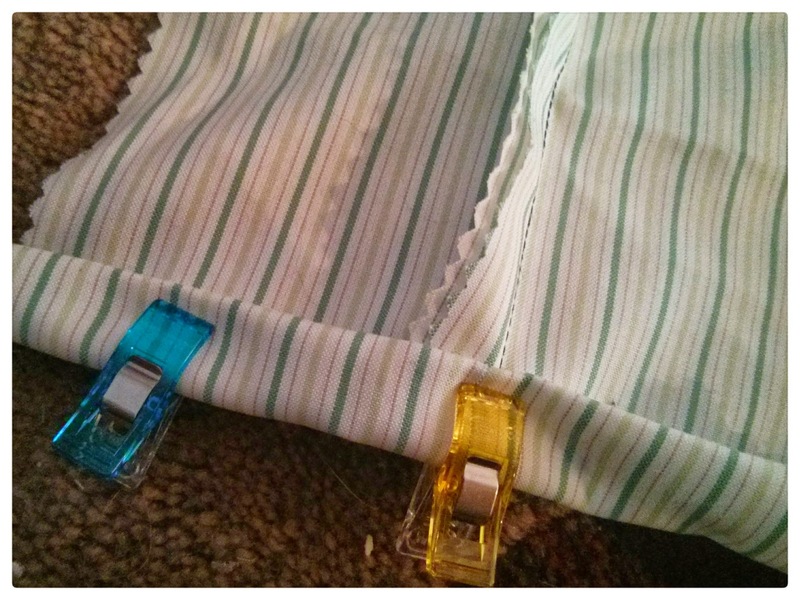 I attached the striped strips to each end of the body of the skirt. Woo hoo! The fabric is officially long enough to create a new skirt! Now, I have a decision to make. SIDE NOTE: My little Clara bug is pleading with her eyes, “Brush me! 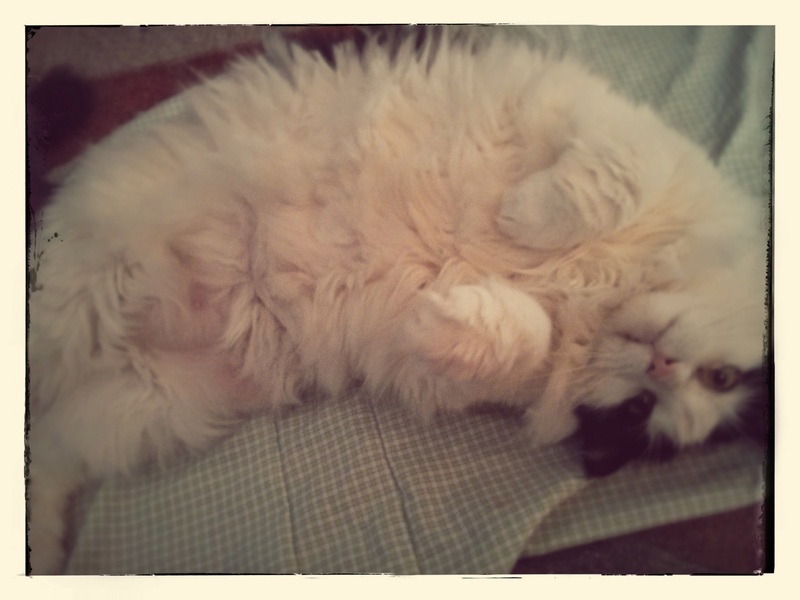 Brush me!” while rolling around on the project. Isn’t she adorable? I love this little kitty. Anyway, I had a choice to make: add a cute ruffle at the bottom to make the skirt a teeny bit longer OR create a fake-ish wrap skirt. Because I used all the fabric from the shirts, I really didn’t want to add a third fabric. I hate hemming. *sigh* I don’t hate it — I just don’t enjoy creating a simple roll hem with difficult fabric. 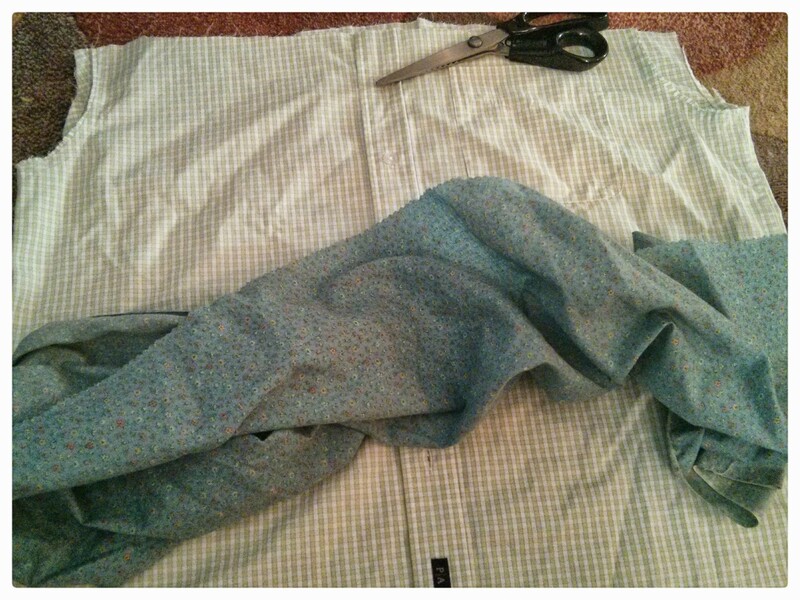 After spending almost an hour fiddling with the roll hem, the third fabric was added to the bottom of the skirt. I just made sure the white chevron fabric trim was just a thin band across the bottom — kind of makes the skirt pop a little but not too much. As much as I didn’t want to add a third fabric pattern, the skirt still looks OK. I inserted a piece of elastic into the waistband (and sewed the waistband shut) BUT I didn’t sew the skirt sides together. 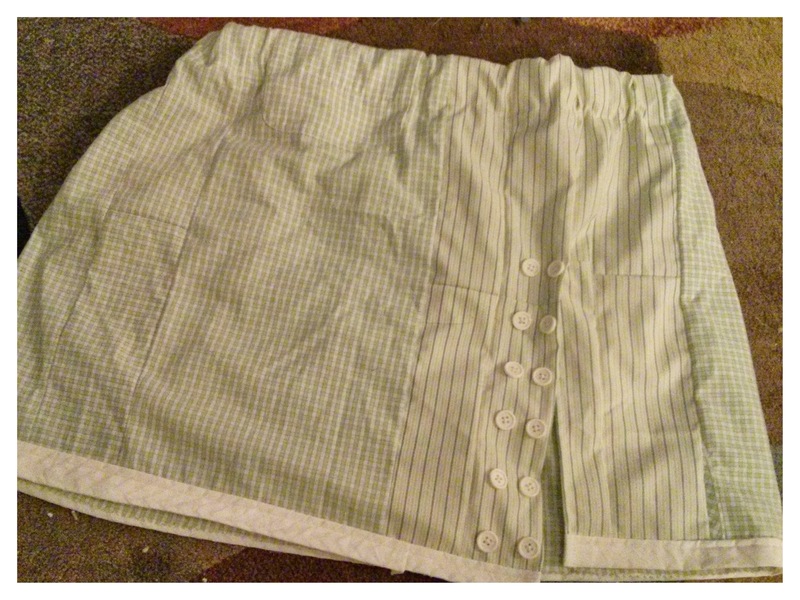 Once the elastic waistband was in place and I made sure the skirt fit well, I sewed shut the skirt about half way because no one needs a peek at my under garments. I completed a simple roll hem on the lower portion for a modest slit. 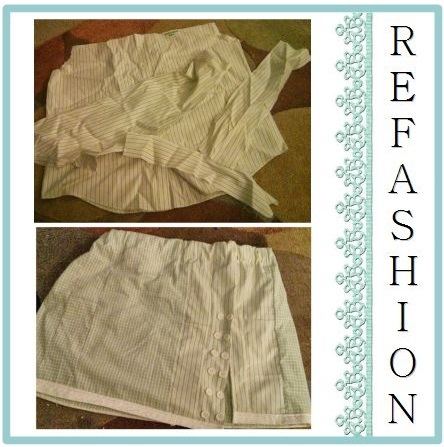 To top off the skirt, I added matching white buttons down the slit area. 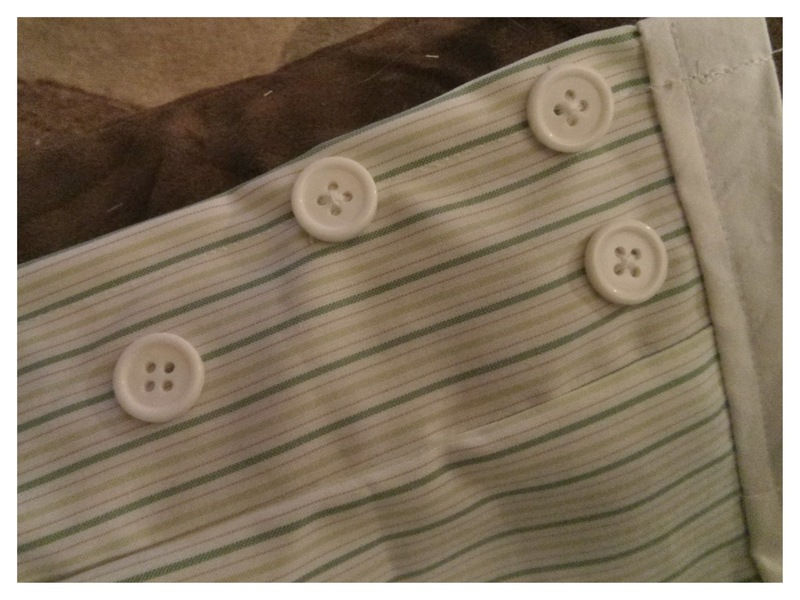 While I was busy hand sewing the white buttons, I briefly thought using simple green buttons to make the skirt pop. Buuuuut, I was half way done with the white buttons plus the white buttons match the thin white trim. Even though a significant amount of time was invested, I think it was worth it. I think you could probably shorten the skirt a tad … looks a little long. Other than that, I like the skirt. Cute skirt. Good job, sweetie.